Lowry specialist for over 30 years. 200+ signed limited editions on display in the studio. All the prints we sell are in mint condition and come with our guarantee of authenticity. We strive to offer the most competitive prices and will always try to better any quotes. 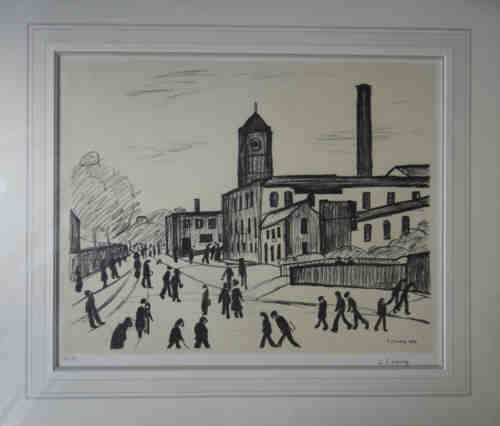 There are 54 signed limited edition prints by Lowry and 17 original lithographs. and a visit to the delightful Cornwater Gallery. "David at www.lowry.co.uk has been most helpful and I would use their services again. 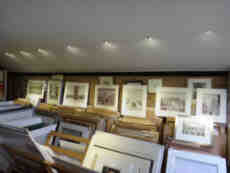 Browse through our Lowry signed limited edition studio in Nottinghamshire. Most limited edition prints illustrated are in stock and very competitively priced! The signed prints usually have an embossed stamp, by the Fine art trade guild, or the publisher's embossed stamp. are simply signed in pencil by L.S. Lowry but not stamped or numbered,although they are limited edition prints (editions of 750). Born in Manchester in 1887 Laurence Stephen Lowry was the only child of Robert and Elizabeth Lowry. which marked the start of a part-time education in art that was to continue for twenty years. until his retirement at the age of 65.
disclosed until after Lowry's death that he had worked for most of his life. Sir Hugh Casson referred to L S Lowry as one of the great English painters of this century. drawing was a very wonderful thing. Lowry was, however, unaffected by impressionist technique of Valette and continued to develop a more realistic approach to his art. In 1909 Lowry and his parents moved to Pendlebury, where initially he was not happy, and for some years ignored his surroundings. the combination of the people and the surroundings were a revelation to him and marked the turning point in his artistic career. and night. All my material was on my doorstep." his highly personal style. From now on he painted entirely from experience and believed that you should paint the place you know. backs of used envelopes recording anything that could be used in his work. and buildings stand out more and he began to experiment with setting them against a white background. He chose flake white building up layer after layer on the canvas before painting the subject matter straight on top. He used only four other colours: vermillion, prussian blue, ivory black and ochre which he applied straight from the tube. of a wall, but frequently suspended in time and space. Northern people; he frequently mixes young and old and he imparts to each figures an individual character. Shelly Rhode in her book A private view of L S Lowry wrote he had a new obsession, his single figures, his grotesques. their background to stand alone, as he stood alone. 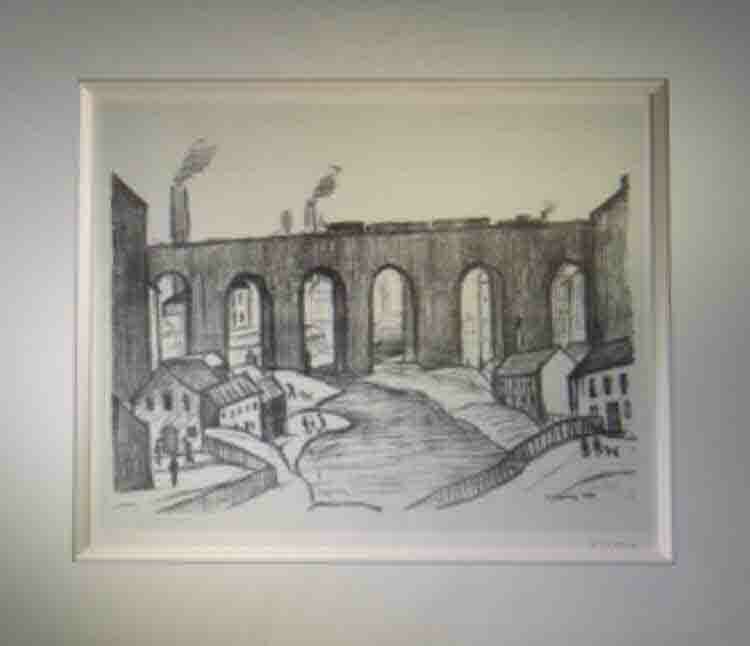 Lowry visited Wales in the 1960s with his friend and patron Monty Bloom which briefly revived his interest in industrial scenes. period are brighter than his Lancashire paintings. inspiration he ceased painting almost completely. the feeling of isolation and rejection throughout his career. praise that was often heaped upon him. becoming rarer and more sought after year after year. The most important private and public collections in the United Kingdom and abroad now hold Lowry paintings and drawings. At the mere age of 15, L.S. Lowry was sent to art school by his aunt. Many thought his work was amateur, but he was determined to prove them wrong. At both Manchester Academy of Fine Art and Salford Royal Technical College, Lowry mainly studied French Impressionism. Inspired by artists such as Ford Madox Brown and Rosetti, he set out to develop a style of his own. In his later years Lowry had many solo exhibitions in London, including the Royal Academy. Very poor, Lowry could afford only to live on Station Rd in Pendlebury, surrounded by factories and industrial sites. At first he hated the atmosphere, but as seen in his pieces, he eventually became enamored with them. Most of his paintings are characterized by what Lowry himself calls the "Industrial Scene." Furthermore, Lowry worked as a rent collector for Pall Mall Property Company. As he traveled throughout the city on foot to collect rent he was able to see the entire industrial area as a whole. Prussian blue, yellow ochre, flake white and no medium (e.g. linseed oil). That's all I've ever used in my paintings. I like oils... I like a medium you can work into over a period of time." In 1932, his father died and Lowry was responsible to take care of his bedridden, 73 year old mother. He was her caretaker for seven years, and only painted while his mother was sleeping. This was a time described by Lowry as depressing and lonely. During this period he mainly painting indrustrial landscapes with no people in them to display his feeling of solitude. However, these were the paintings that would later make him famous. His mother died in 1939, and Lowry painted "The Bedroom Pendlebury" in reaction to this event. Throughout his lifetime, Lowry produced thousands of pencil drawings, these have become very collectable and the most detailed ones are very professionally drawn. she was a young girl, asking how she may learn to be an artist. At present it is valued at around £10,000,000 and is on display at the Lowry Centre in Salford Quays. 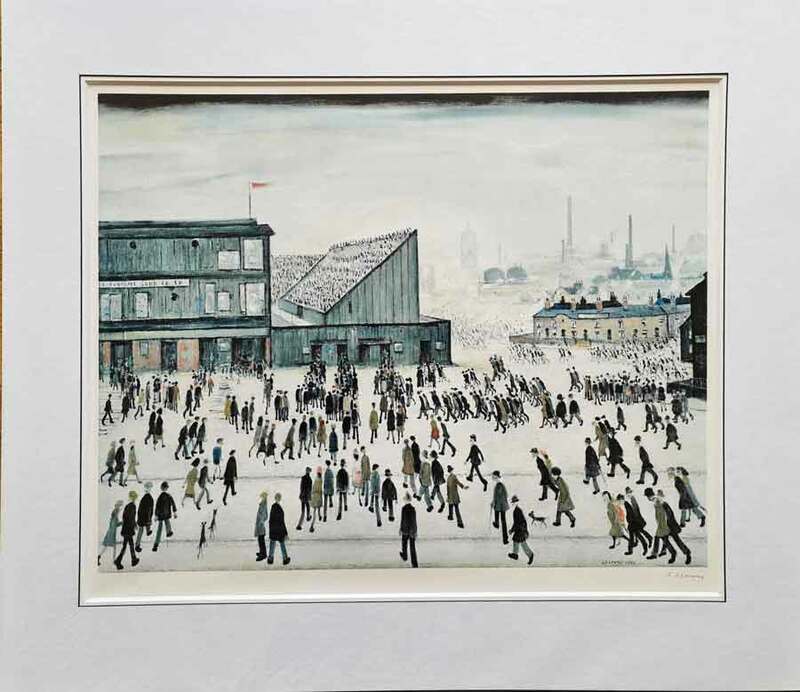 and in 2015 the signed limited edition of 'Going to the Match' was sold for £28,160. Lowry's paintings, and in particular his signed limited edition prints are becoming increasingly sought after and we have seen a huge demand in recent years with a sharp decline in available work on the market. From an investment point of view, it does appear that Lowry signed limited editions are a great investment for the long term. A major exhibition of paintings and drawings by L.S Lowry was held in The Tate Gallery 2013. It attracted record attendances. Limited editions, prints and lithographs for sale. also the fine work of Sir William Russell Flint whose paintings and signed prints are highly collectable. The work of Mr L.S. Lowry has become of great artistic and financial importance of recent years. Blog xml sitemap html sitemap lowry.co.uk/urllist All major credit/debit cards accepted.